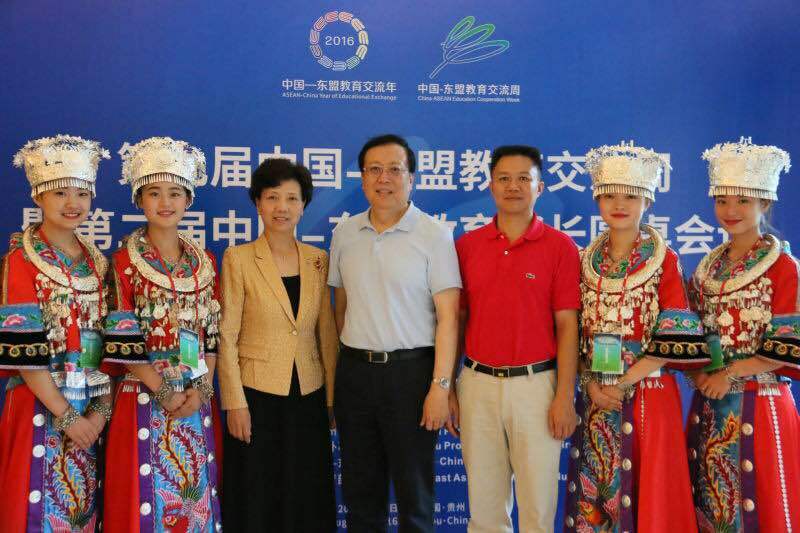 On August 1, 2016, the opening ceremony of the 9th China-ASEAN Education Cooperation Week and the 2nd China-ASEAN Education Ministers Roundtable Conference was held in Guiyang. Vice Premier Liu Yandong attended and delivered a keynote speech. Liu Yandong expressed that this year marks the 25th anniversary of the establishment of China-ASEAN dialogue relations as well as China-ASEAN Education Exchange Year. China always regards the ASEAN as a priority of its diplomacy. President Xi Jinping stressed to join hands to build a closer China-ASEAN community of common destiny, and Premier Li Keqiang proposed to advance China-ASEAN "2+7" cooperation. In recent years, China and ASEAN countries have gradually deepened communication and cooperation in various fields, with education cooperation as one of the highlights. Both sides have hosted Education Cooperation Week for eight consecutive years, and have signed nearly 800 cooperation agreements, forging a resounding brand of people-to-people and cultural exchanges. Liu Yandong noted that Premier Li Keqiang and Prime Minister Thongloun Sisoulith of Laos, the rotating presidency of the ASEAN, sent congratulatory letters to the cooperation week, hoping to build cooperation in people-to-people and cultural exchanges, including education, into a new pillar of China-ASEAN strategic partnership. China and ASEAN countries can draw on each other's advantages and share resources for mutual benefit and win-win results in education. First, the two sides can improve the cooperation mechanism to serve the docking of strategies of both sides. Second, the two sides can build characteristic brands to expand the influence of the cooperation week. Third, the two sides can enrich forms of exchanges to lift the level of practical cooperation in such areas as basic education, vocational education and linguistic education. Fourth, the two sides can enhance youth exchanges, forge the updated version of the China-ASEAN program of Double 100,000 Goal of Student Mobility and set up a China-ASEAN Maritime Silk Road scholarship. Over 1,400 Chinese and foreign guests attended the opening ceremony of the Education Cooperation Week themed "Education First, Make Dreams Come True Together".